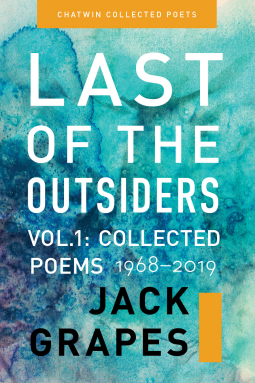 "Last of the Outsiders" offers a sweeping view of prolific American poet Jack Grapes’ fifty-year career. Presenting the core of Grapes’ poetic work, the collection ranges from poems originally printed in 1968 to work written in 2019. The title, "Last of the Outsiders", reflects both Grapes’ ties to "The Outsider" journal and his standing as an outsider with no allegiance to any one school of poetry. Eternally a chameleon, Grapes defies easy classification; he has been labeled in various periods as an “Outsider Poet,” a “Stand Up Poet,” a “Revolutionary Poet,” a “Confessional Poet,” and a “Man of his Time.” Simultaneously surreal and realistic, desolate and comedic, witty and urbane, Grapes’ work taps into the diverse trajectories of American poetry while never settling on any single viewpoint.